Congratulations to John Mattson, who was the first person to correctly identify Las Cruces, New Mexico as the location of photo 1 in the Where?s Cherrie Road Trip Contest. 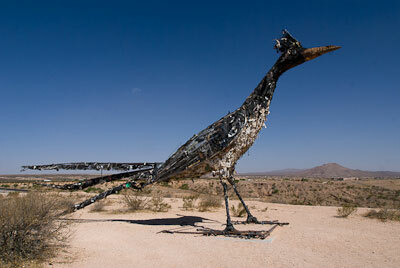 John also answered the second part of the question — the unique roadrunner sculpture is made entirely out of metal and trash (from the old city dump). It’s located off Interstate 10, near the airport. More specifically it’s at the rest area just past exit 135, going east. There is accessible parking and a level sidewalk to the viewing area, but there’s no accessible path out to the sculpture. But to be fair, there’s no path out to the sculpture at all — just a low cable fence and a warning sign about snakes in the area. Still, you can get a good (safe) look at the sculpture from the viewing area. All in all, it’s a cool kitsch road trip stop, so check it out next time you’re in the neighborhood. This entry was posted in Road Trips, Traveling Cherrie and tagged accessible travel, car travel, disabled travel, giant roadrunner, las cruces, new mexico, road trips, roadside attractions, sculpture by Candy B. Harrington. Bookmark the permalink.